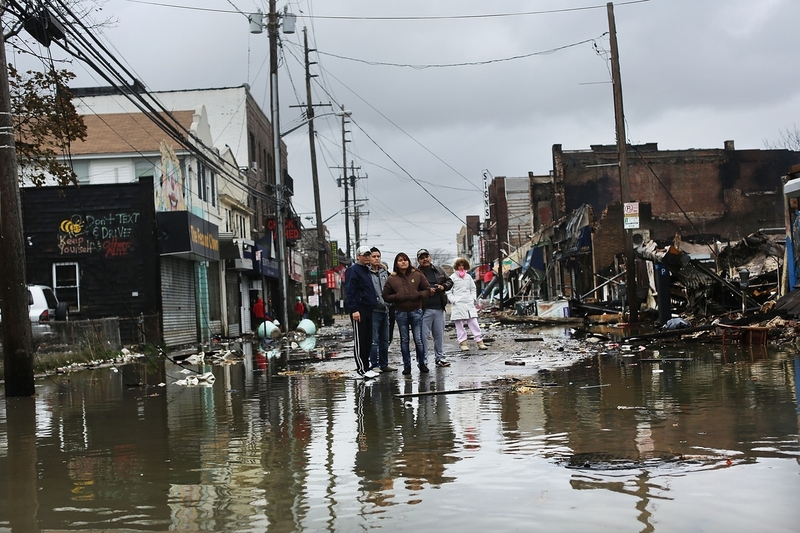 Sandy Leaves Long List Of Health Threats : Shots - Health News Public health officials are warning that people in areas devastated by Sandy face many risks in the storm's aftermath. They are urging people to protect themselves from health threats in the water, air and even their refrigerators. People look at homes and businesses destroyed during Superstorm Sandy on Tuesday in the Rockaway section of Queens, N.Y. These infections can be serious for babies, the elderly and people who are already sick. But in the United States, contaminated floodwater rarely causes the kind of widespread disease outbreaks that can occur in less developed countries. "In our recent history, we haven't really seen a lot of outbreaks that are associated with floods in general here but that doesn't mean we still shouldn't take caution," Tan says. "If for some reason you come into contact with floodwater — that there's floodwater that touches the skin — wash your hands with soap and clean water very often just to clean yourself of any sort of potential contaminant," Tan says. In places where drinking water supplies may be contaminated, people have to boil their water for a minute before it's safe to drink. Dan Kass, the deputy commissioner for environmental health at the New York City Department of Health and Mental Hygiene, says that's one thing Manhattan doesn't have to worry about. "The genius of the New York City water supply is that we have ample reservoirs located away from the city that are not groundwater based," Kass says. The water also flows downhill so no electricity is needed to pump it in. 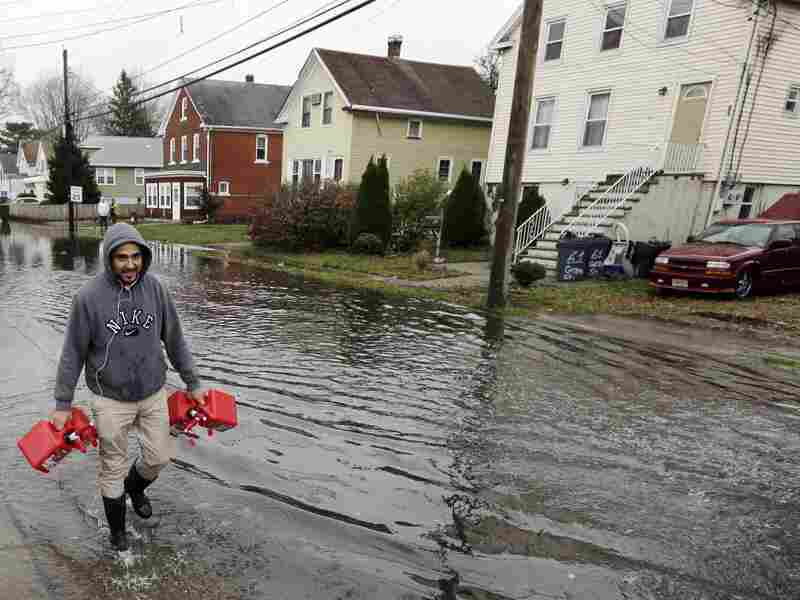 Christian Codorniu carries gas containers Tuesday to fill a home generator following the superstorm in Little Ferry, N.J. While some people may wonder whether the flooded subway system may fill the streets with fleeing rats, officials say that's not a problem either. There are far fewer rats down there than people think. And many of those there probably drowned, Kass says. A much bigger worry is what might be in the air. One of the most common killers after a big disaster is carbon monoxide poisoning among people misusing generators. "They can't be used indoors. They have to be properly vented. And while people are desperate for power, they sometimes take shortcuts or don't really understand the risks associated with that," Kass says. Aside from the water and air, other dangers may lurk. Downed wires can electrocute people. And people needing dialysis or other life-sustaining care often can't get to what they need. For example, many people lose their prescription drugs. "They may not have critical belongings that they need not only for sort of physical health but also for mental health. And so that's something that's a huge challenge for people," Kass says. There are other dangers for people who are still home. And that's in their refrigerators. Tom Frieden, who heads the Centers for Disease Control and Prevention, says food poisoning is a common problem after disasters. That's what happened when he was the health commissioner in New York City. "In 2003 there was a long blackout in August, and we saw a significant increase in foodborne illness in the days after," Frieden says. Frieden says food in the fridge stays cold for only about four to six hours without power. Food in the freezer holds for maybe 24 to 48 hours. After that, don't risk it. "Bottom line is: If in doubt, throw it out," Frieden says. Once the waters recede, mold could start growing in a lot of homes, triggering allergic reactions and asthma attacks. "Some of the things that people can do to stop mold from spreading and growing in homes is to take out items that have soaked up water and can't be cleaned or dried," Tan says. "Try to fix those water leaks and use fans and dehumidifiers. Open the doors and windows to remove moisture just in general." In the audio of this story, as in a previous Web version, speaker Dan Kass says that New York City's water supply has "ample reservoirs located away from the city that are groundwater based." Kass misspoke; the reservoirs are not groundwater based.